So you want to restore an older car. Lets first start with a few rules. Don't think for on second you are going to sell the vehicle at a profit when it is finished. If you do a dodgy job of it you will make enemies of those who might purchase it and it may be destroyed for further restoration. More projects are passed on unfinished than are ever finished. They often end up on the tip. Can you find a project someone else has started but not finished ?. The value of a partly completed project is almost zero and you may find a bargain. When contemplating a restoration you must take into account a few personal factors. Do you have the money to make it a "cheque book" restoration or must you do most of the specialised work yourself. Do you have the necessary skills to accomplish the various jobs to be done or are you prepared to firstly attend courses, or to obtain "How Too" books and videos on the various tasks you will have to undertake, and to practice before starting on your project. Do you have the shed space and do you have understanding neighbors who will put up with the noise and smells associated with the work. Environmental pressures may one day prohibit us from persuing our hobby at home. I believe soon we will not be able to wash our cars in our own back yards or on the street because of the materials it puts into the water table. Do you have the necessary tools and equipment available. Do not buy cheap tools. The socket and spanner sets so often advertised in the junk mail will not be up to the task of undoing rusted bolts that have not been undone for many years, the cheap screw drivers will not last long and the heads will fall off the cheap hammers. Bear in mind you are taking on the tasks of up to five trades, Panel Beater, Spray Painter, Auto Electrician, Mechanic and Motor Trimmer. If you wish to reconstruct panels that are unobtainable you will also have to try your hand as a Coach Builder. What should I restore ? Lastly a few words about what you should restore and how much it should cost. If you are starting out in the hobby, find yourself something that is both common and likely to be a classic Automobile in the future. In Australia the are a number of cars from the sixties and seventies that are already classics and parts should not present much of a problem. Here in Australia, the two door Falcons from Ford, the two door Monaro from Holden and the Charger from Chrysler. Add to this list the up-market models offered by the big three auto makers of these decades and you will have plenty to choose from. All these cars were made in large numbers and shared many components from model to model. After market reproduction parts and "New Old stock" parts are readily available from specialised suppliers and from swap meets and even trash and treasure markets. If you are a bit more adventurous and your budget is a little bigger, you may like to tackle an MG or Triumph, a Datsun or Toyota sports car or one of the great Italian sports cars from Fiat or Alfa Romeo. Parts for MG and Triumph are readily available and although usually made in England or the USA, are sold locally by specialised suppliers. Do not hesitate to use the Web to search for parts, I have found many parts for my rare Alfa Romeo vehicles from the web and although the Australian Dollar is not doing too well against other currencies, these parts have not been expensive. 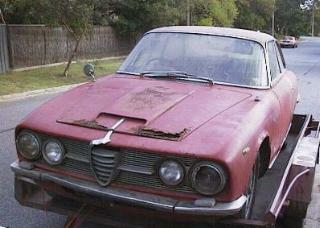 Have a look at my Alfa Romeo 2600 project. Many American muscle cars of the sixties are finding there way DownUnder and as there is a vast stock of parts for these in the USA. They should make easy restoration projects. As with any imported vehicle, you will have to rely on importers or source your parts yourself. Importing parts is quite easy but remember packaging and transporting large body panels can be expensive. And now for the million dollar question, how much will it cost. This is also the impossible question, my best estimates for all my projects have been at least 100% too low. If you choose a common locally produced car that is in not too bad a shape, and do most of the work yourself, you will spend somewhere between perhaps A$5,000 and A$10,000, depending how far you go with making it perfect, and as near original as you can. Well, I have not talked you out of it yet. Lets get started. Firstly even if you cannot do the body work yourself you can save a lot of money doing all the disassembly and cleaning of the vehicle before it goes to the body shop.